1.) Ensure the barcode scanner that has been purchased can read an 11 digit NDC. If experiencing any issues scanning an 11 digit NDC the company the scanner was purchased from should be able to provide a quick way to configure the scanner to read the 11 digit NDC by calling their technical support line. 2.) Each user of the Guardian system should have been provided their USER ID number or a Barcode that has been mapped to their USER ID to log into the NDC Checker. CarePoint Support can assist in providing this information for you. ***Select user_id, login_name, fname, lname from csuser will provide list of user id from cph database. 3.) Create a shortcut to the Desktop from the NDC checker executable onto the workstation(s) using the barcode scanner. This is usually found on the local hard drive (i.e. C:/Program Files/CarePoint, Inc./Guardian/Bin….NDCChecker.exe). 4.) 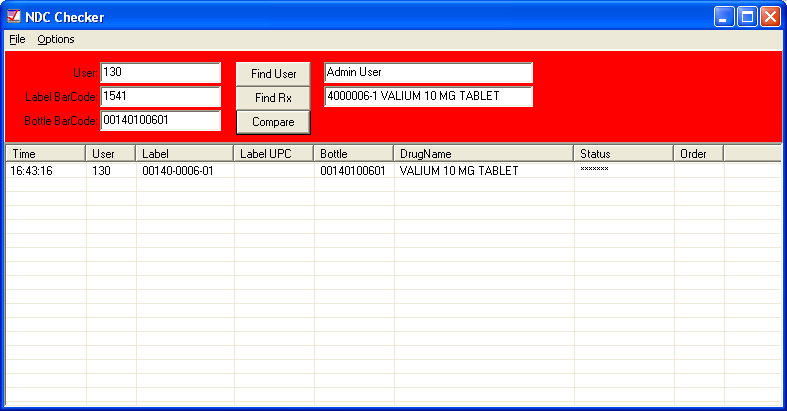 Add a barcode onto the pharmacy label or file copy that is mapped to the Rxdisp_id field for scanning the dispensed NDC. 1.) The user can key in their User ID number or scan the barcode mapped to the user id into the User field as shown below. Click Tab and the username will verify in the adjacent field. 2.) The barcode on the pharmacy label or file copy should now be scanned. This should populate the Rxdisp_id or identifying script number in the Label Barcode field. In the adjacent field the drug name will populate. 3.) The barcode on physical bottle should now be scanned in the Bottle Barcode field. This will usually populate the corresponding NDC number and automatically confirm a match to the drug dispensed. Note: You do not need to click on the Compare button. The buttons are automatically clicked by the barcode reader. 4.) After scanning the barcode on the bottle, if correct, the word “Match” will display under the Status column and all fields at the top are cleared to allow for the next NDC check. 5.) If the incorrect drug is scanned it will appear as ******* in the Status field. Note: Fields at the top do not clear as they do when there is a Match. The field remains populated so that you can re-scan. In the menu of the NDC Checker notice the word Option. Here you can configure the NDC Checker to retain the user that is logged in so that the User ID or barcode isn’t required each time you check a drug with the dispense.